All cabins have air condition which can be run for several hours daily during naps or when preparing to sleep for the night. Her crew enjoys setting sail at available opportunities and are there to look after all our guests' needs. totally refitted 2012, aboard you'll find all safety and navigation equipment, VHF, television, refridgerator, icebox, warm & cold water system, canoe, dinghy, outboard, radio/CD player, full galley for 12 guests, fishing and snorkeling equipment. Comfort/Recreation: Spacious sun deck area with Sun mattresses and cushions, Sun awning, Cushioned aft deck with a large table, Deck chairs, spacious saloon with bar and dining table, Music Set, Color TV, Fiber Dinghy with outboard engine, Snorkel and Fishing Equipment, 2 Canoes. The crew of three have their separate quarters. Equipment: Complete navigation equipments, Mobile Phone, Generator 12 kW, 12 + 220 V, Life Raft, Life Jackets, Fire Extinguishers, Fully equipped Galley, Deep Freezer, Ice Boxes. If there are vegetarians among you, no problem at all, the Turkish cuisine is the best solution for that, you just tell us. Soft Drinks and alcoholic drinks are extra, we offer you to buy them in a supermarket and you just pay us the bill plus a service-extra of only 10% (that's for the crew): We think that's a fair offer and all our previous guests did appreciate that. Embark / Disembark : Upon agreement to agreed harbour, date & time. Preferable Bodrum or Marmaris. When you are planning your itinerary for the Greek islands, keep in mind, that Greek harbour-taxes are extra. There is nearly none of the gullet charter-companies who tells you the truth about the use of air-condition on Gullets. 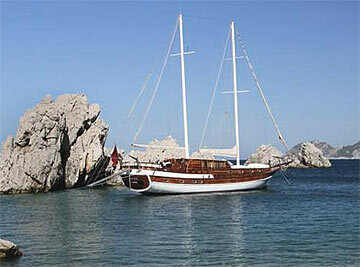 Yes, yes M/S AZRA DENIZ has AC and you think you can switch it on when you like. It's not! On a boat the AC can only run when the generator is on, or in a harbor when connected to 220 Volt. But mainly you are in anchor bays, often next to a neighbor who doesn't like the noise of your generator and you wouldn't like it either during the night for example. and if you encourage the captain and the Chef: "hey it looks like we can have a bit of sailing to, so we do not need a lunch, we can do with sandwiches, so the cook doesn't have to work in his slope kitchen." Because the captain does't know his clients, he even has guests sometimes who do not like sailing ! The M/S AZRA DENIZ meets international safety regulations including life jackets, fire extinguishers and alarms.